Pope Francis met Friday with the president of Colombia and Nobel Peace Prize laureate, Juan Manuel Santos Calderon. The meeting later had a second and third part, thanks to the Vatican’s discreet diplomacy. Although it was not planned in the Holy Father’s official agenda, the former Colombian President Alvaro Uribe Velez was also invited, announcing in Colombia on Thursday his plans to make a trip to Rome. The conversation during the meeting between the Holy Father and the Colombian President was held in an atmosphere of great cordiality, confirming the good existing relations between the Holy See and Colombia, reported the Vatican press office. Then the Holy Father met for 20 minutes with Senator Uribe, who landed in Rome just that morning. Then, the Pope gathered them together for a joint meeting, which lasted some 25 minutes. The Pope spoke of the “culture of encounter” and he pointed out the “importance of a sincere dialogue between all the actors of Colombian society in this historic moment.” As Greg Burke, the Director of the Holy See Press Office, mentioned, Francis indicated that he will travel to Colombia when the peace agreements are totally consolidated and legalized. 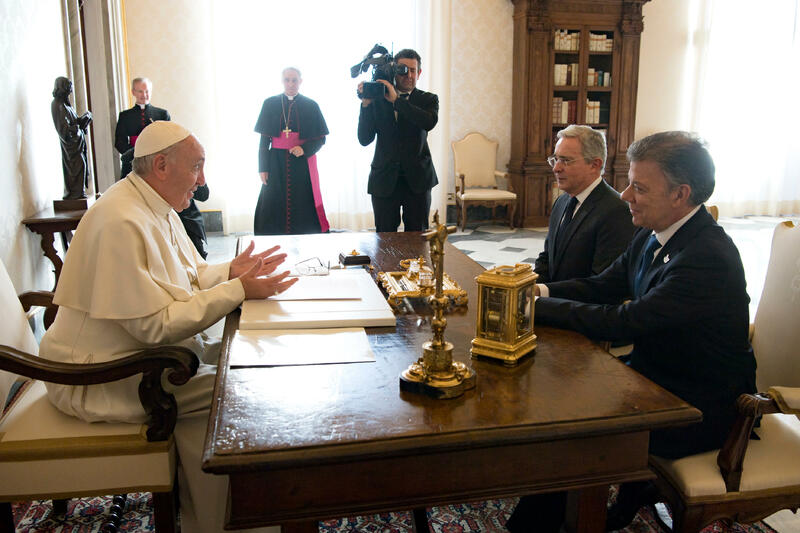 The two Colombian leaders also met with the Pope’s Secretary of State, Cardinal Pietro Parolin. After the “No’ in the referendum on the Peace Treaty between the Colombian Government and the FARC, there were dialogues, he said. He also stressed that they are not against peace but in favor of a modification of the agreements. Therefore, he indicated that, in the presence of the Pope, he requested President Santos’ “openness.” The Senator also insisted that hatreds have no place in the democratic battle, stressing at the same time his willingness to dialogue with the Government. For his part, in his statements to the media President Santos stressed that the Pope “has also been a person who from the start has been supporting the peace process.” Therefore, he thanked the Holy Father “for all the gestures he made.” He said the Pope has reiterated his support of the new peace agreement and of the prompt implementation of the agreement. Fortunately, added the Colombian President, the process now begins with the approval of the Constitutional Court. President Santos said to former president Uribe: “we are always ready to continue dialoguing” and “to enter an agreement on the way it will be implemented.” Division and polarization does not suit anyone, said the President, asserting that peace is built “as a cathedral,” namely, “brick by brick,” and that requires the effort of many people over a long time.